I'm going to write a little about dora the explorer birthday parties, as Dora is 10 years old this year, August 15th in fact! To celebrate this she'll be throwing a big Dora birthday party of course. I remember my kids loving Dora when they were smaller, and of course we parents love Dora as she's educational and relatively peaceful compared to much of what modern day TV has to offer. My kids also left their innocent years with a few words of Spanish in their vocabulary too. 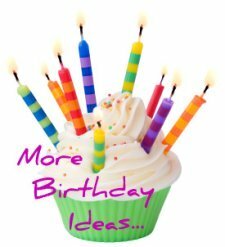 So if you're wanting to throw great dora the explorer birthday parties you'll be needing some of my dora birthday party ideas. The really good thing about going with a theme like a dora the explorer birthday, is that you don't need to make many decisions! Just make or buy everything dora and job done. 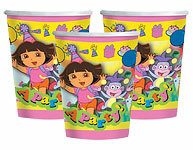 You'll be needing some dora birthday invitations, a good selection of dora birthday party supplies,. and of course a great dora birthday cake. If you have the time, you can make your own invitations. We're going on an adventure with Dora the Explorer. Please join us for Chloe's 3rd birthday. Of course Dora never goes without her map, so you can use a map for some game ideas. A treasure hunt using a map is an obvious idea, you could draw a treasure map of your house and photocopy it for each child. Print out this Dora map as a colouring page. 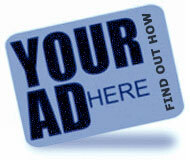 Pin the tail on Boots would be a traditional birthday party game with a Dora twist. What's hiding in Mochilla (rucksack)- Put a variety of small treats in Mochilla, and then sitting in a circle the children pass the rucksack round to music. When the music stops the child can take something out of the backpack. Of course Dora's native language is Spanish, so you could base the food on a Spanish theme. 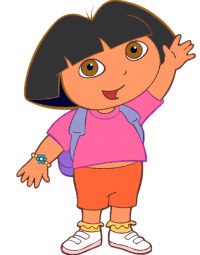 Alternatively there are some wonderful Dora recipes on the NickJ website.. Including Dora starfish cookies, snacks and even some cool dora birthday cakes. At the end of the party you could read a Dora story to quieten every-one down before going home with a Dora party treat.